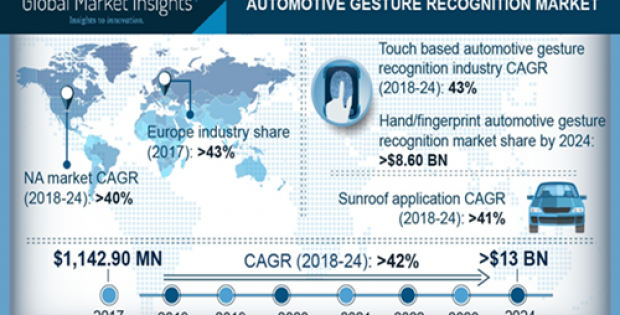 Automotive Gesture Recognition Market for Multimedia, navigation, and infotainment systems showcased a significant growth rate at around 44% over the study timeframe. Increasing trend towards providing customer comfort along with the requirement for advanced navigation facilities supports the industry expansion. Further, the proliferation of advanced connectivity applications including Android Auto and Apple CarPlay offering higher quality multimedia and navigation content within the vehicle, further accelerates the segment penetration till 2024. Europe accounted for over 43% revenue share in 2017 owing to the presence of major automobile companies focusing on introducing advanced infotainment systems in their products for improving the driving experience. Further, supporting government regulations for introducing multiple safety standards for vehicles as standard is further supporting the industry expansion till 2024. For instance, the European Commission announced the mandatory fitment of technologies including e-call technology and automated emergency services in automobiles, thereby providing a positive outlook for the industry growth. PCVs accounted for more than 2,500 units in 2017 and is expected to continue its dominance over the projected timeframe. This can be credited to the increasing automotive sales across the globe. Improving living standards along with proliferating disposable income further supports the industry share over the projected timeframe. Increasing sales of luxury and premium vehicles with advanced electronic systems along with the availability of multiple models at varied price range further supports the business expansion over the forecast timeframe. Increasing adoption of electronic components in vehicles for complying to stringent government norms associated with vehicle safety and emission are supporting the industry expansion. Usage of gestures for controlling various operations within vehicles including changing music, answering phone calls, and control the navigation are further strengthening the industry growth. Few of the players in the automotive gesture recognition market place include Harman International, Delphi Automotive PLC, Sony Depthsensing Solutions, Melexis, Continental AG, and eyeSight Technologies Ltd. Other notable players include Texas Instruments, Intel, Visteon Corporation, and Synaptics Incorporated. 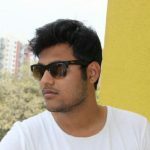 Industry participant are continuously innovating their product portfolio and introducing innovative technologies for gaining edge over the competition.